Until 2002, 10% of the royalties from my books were used by EPM for its expenses, and 90% were given away to worthy ministries, especially global missions. Since 2002 we have been able to donate 100% of all book royalties—and sometimes more—to worthy ministries, as well as some to help facilitate the giving away of our books to people all over the world. Since the inception of Eternal Perspective Ministries in 1990, EPM has given over eight million dollars in book royalties to ministries around the world. We’re grateful to the Lord for His provision. But regardless of what material things surround it, this view of reality remains focused on the ultimate pleasure of possessing Christ. Our Lord is pleased when we live in a way that reminds us of, and introduces others to, what’s truly the greatest pleasure and possession of life—our Lord Jesus. 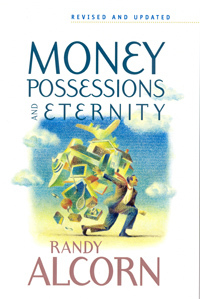 For further development, see Money, Possessions, and Eternity by Randy Alcorn. See also our resources on money and giving, as well as Randy's other related books. First, commit yourself to regular giving to your local church and above and beyond giving to missions and other ministries.